The Earl Bascom mug is part of a biographical series profiling unique athletes in a variety of arenas from baseball to rodeo. An image of Earl Bascom and a short biography are features of this history mug. This James Hope mug is part of our collection of Civil War biographical mugs. An image of James Hope, one of his paintings and a short biography are features of this history mug. This James Hope mug is part of our collection of Civil War biographical mugs. An image of James Hope and a short biography are features of this history mug. The Rowland Evans Robinson mug is part of a biographical series profiling unique individuals who shaped the history of Vermont and the United States. 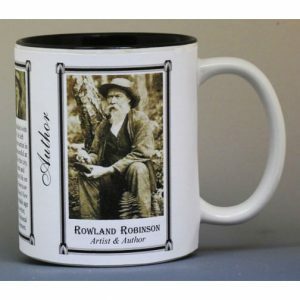 An image of Rowland Evans Robinson and a short biography are features of this history mug.